As anyone who knows me knows, I am a self-proclaimed country (music) girl. Despite being born and raised in Philadelphia, my heartstrings most likely belong to a steel guitar. I worship at the altar of King George Strait and still consider The Judds' breakup one of the saddest things to ever happen in music. Having said that, there is a part of my soul which belongs to hip-hop alone, a part craving its unmistakable, irreplaceable swagger and energy. For everything country music gives me, it cannot give me that. And after the BET Awards took us back to 1994 with Brandy, MC Lyte, YoYo, and Queen Latifah's epic performance of "I Wanna Be Down (Remix)"the other night, I thought it fitting to dedicate today's Throwback Thursday category to the pioneering women of hip-hop, the ladies who paved the way for Kim, Foxy, and 'em. 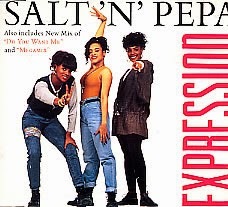 And if I'm having this conversation, then I'm talking about Salt-N-Pepa. Though "Whatta Man" is my favorite Salt-N-Pepa track--the En Vogueness of it all should make that obvious--the first SnP track I ever loved was from their third album, Blacks' Magic. As a young Christian girl not allowed to listen to secular music, I nevertheless saw this video on The Jukebox Network at my grandmother's house one afternoon, and my life was changed. Though the camera work gives me vertigo and some of the outfits confuse and vex me, the song's simple, powerful message resonated with me then and still moves me nearly 25 years later. "Go 'head, girls! Express yourselves!" What say you? Hit me with a track from your favorite pioneering woman/women of hip-hop.